Switching to a new phone and falling into the trouble of how to transfer data from the old phone to the new one? 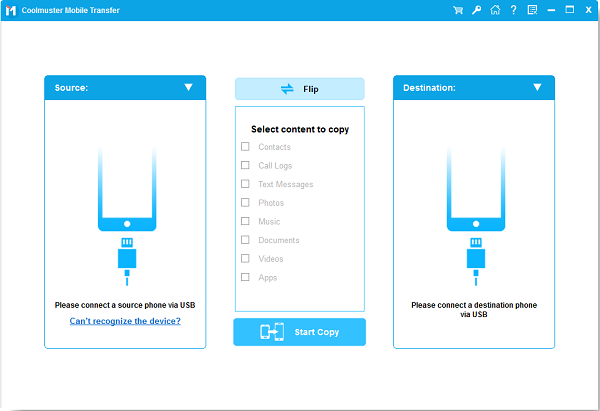 Make it an easy transition with the help of Coolmuster Mobile Transfer, which empowers you with the ability to transfer overall data between two mobile phones (Click to learn how to transfer photos between two Android phones). Devices & Carriers: Be compatible with phones and tablets run iOS and Android OSes, such as iPhone, iPad, iPod, Samsung, HTC, LG, Sony, Google, Motorola and more. It’s fully compatible with AT&T, Verizon, Sprint and T-Mobile, etc. carriers. Support Data types: Almost all file types can be supported by this phone to phone data transfer, such as Contacts, Text Messages, Call Logs, Calendars, Safari Bookmarks, Photos, Music, Videos, Documents, Apps, eBooks, etc..